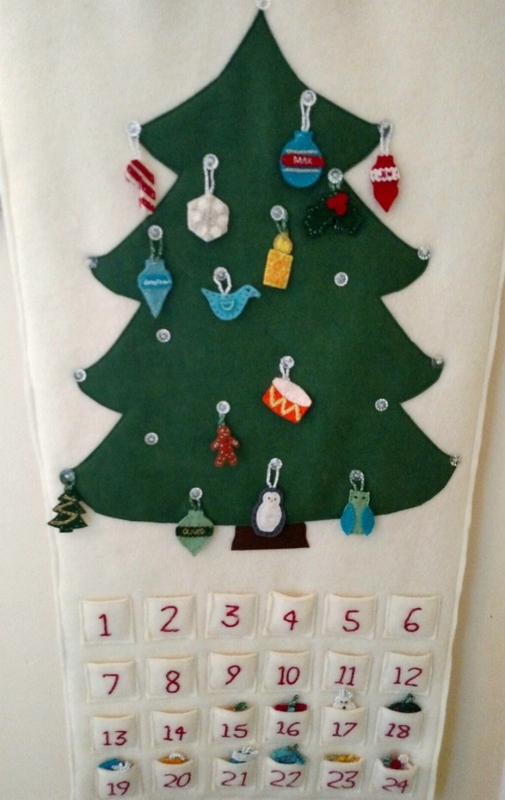 At long last, here is the advent calendar, belatedly in January. As you can see, I hung it in a poorly lit place in my house so the photos aren't great, but whatever, the thing got done! 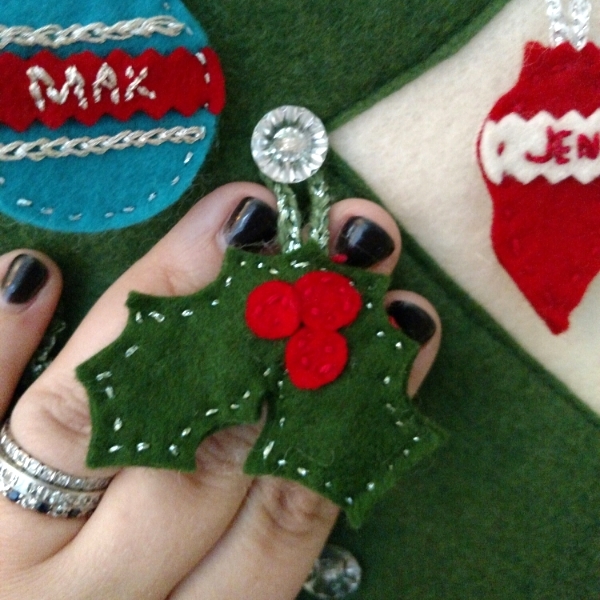 Each ornament is double sided, except for the one blue name ornament, which was thicker felt. All the rest of them have the same thing, with slightly different embroidery on the reverse sides (save the owl and penguin, which have faces/bellies/wings only on one side). Not only does it look nicer, but they're a bit more sturdy as well. Plus, I'm a stickler for nice looking embroidery backs and this way everything's hidden. I'm pretty pleased with how it's come out! I have my favorites, and there are a few that I think I'll replace in the future as well. The full thing, clearly taken on the 14th of december. Holly, with individual berries on both sides. Tree. The garland was better in theory than in execution. I may redo this one in future years. look at the penguin's lil belly! I love him. candle. The stripes are different on the reverse. 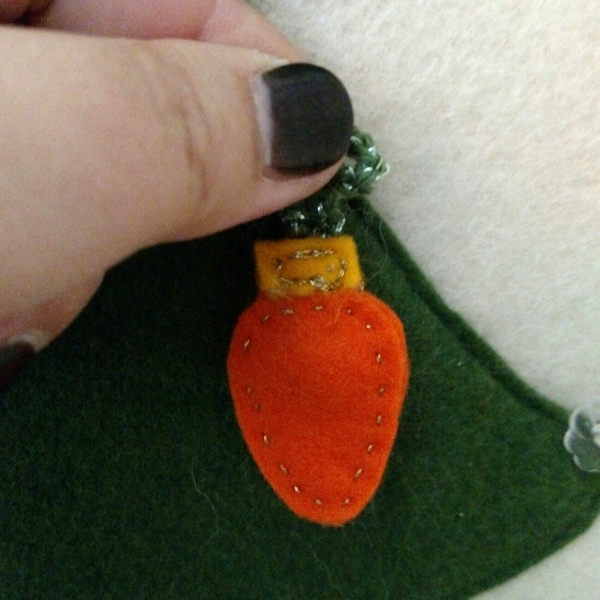 Present, no bow though, because it looked weird and i got tired of trying to make 1/4" pieces of felt bend to my will. french knots! I can finally finally finally do french knots! and went a little overboard with them here, on both sides. a bell. It's a bell, it's fine. The mitten is one of my absolute favorites. 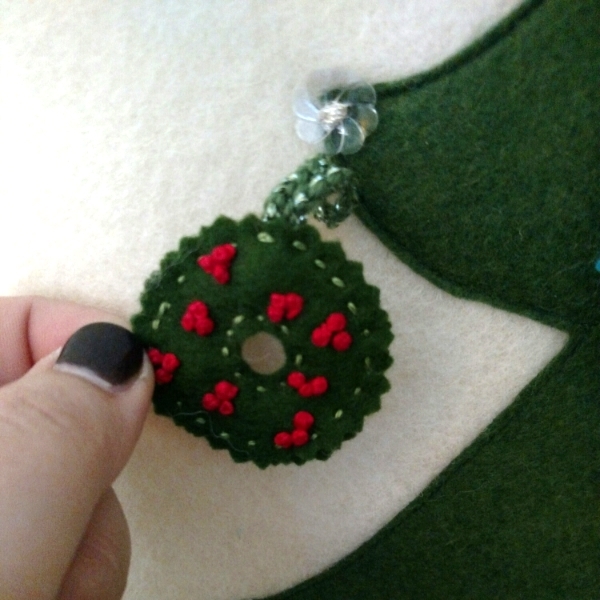 I love how the big chain stitching mimics knitting, and with it on both sides the ornament is super squishy! I'm kind of meh on the bird. He got a bit mangled by the toddler this year, so I think he might be the first to be replaced next year (the bird, not the toddler). I'm pretty pleased with the drum, all in all. santa hat--i drew this shape freehand (along with all the others), but thankfully got the jaunty angle done the first time around! The first one done! Pattern is the same on both sides. Oh, look. A short name. How easy, how quick! The only single sided ornament, because there is no way I am going to try to embroider 8 letters on a 1 1/4" x 1/4" piece of felt twice. candy cane. I sewed the stripes on individually, but cut them longer and then trimmed to fit the white base after they were on. snowflake. This one is one of my favorites, and it was fun to embroider as well. 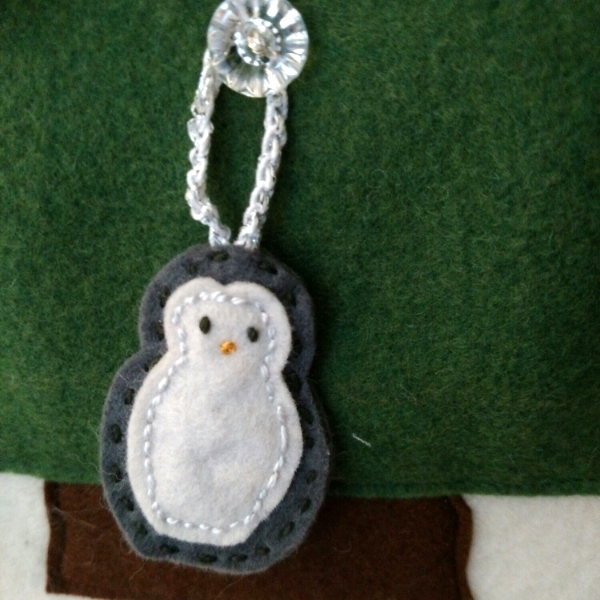 Snowman, no hat, because haven't i already tortured myself with fiddly pieces enough? candy piece--super fiddly, but also kind of fun to make and figure out since the white swirls repeat on the reverse. A wee stocking, cute, but fiddly. This one is the littlest little's favorite: "COOKIE MAN!" the star--also the only one with a different hanger (all gold). This is three layers, the darker layer was embroidered separately then sandwiched between the two yellow stars, and the whole shebang embroidered again.